We are thrilled that For Love of a Dog has been included in the 2013 Craftsyble Valentine's Day Gift Guide! Each year Craftsyble hand picks just a few products that would make perfect fits for the one you love. This year their gift guide includes a one of a kind handmade dog lover bracelet from For Love of a Dog. Our Hot Pink Bling Dog Lover Bracelet includes some wonderful artisan lampwork beads: heart, dog bone, paw prints and flowers, plus sparkling crystals and a sweet silver dog collar toggle. The 2013 Craftyble Valentine's Day Gift Guide is full of fabulous ideas - all handmade products - including these listed below. 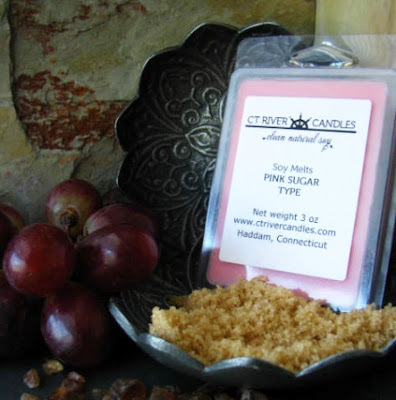 Pink Sugar Soy Melts from CT River Candles are handmade with 100% natural soy wax and richly frangranced. (Think cotton candy, vanilla, caramel and bergamot with touches of orange citrus, strawberry and plum.) Each package provides 40-60 hours of scent! Jewels For Hope will donate a portion of the profits from their Unisex Red Jasper Charity Bracelet to Labs 4 Rescue! 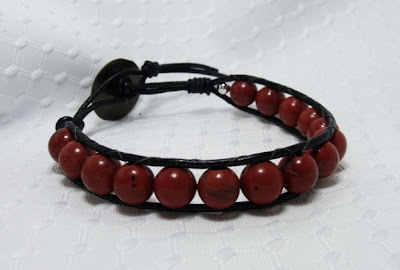 This handmade leather cord bracelet is perfect for both men and women. Nair & Bjorn donate a portion of their business profits to no-kill animal shelters every year. 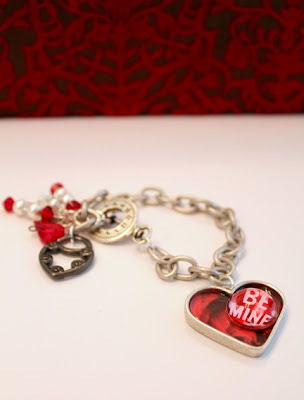 Their "Be Mine" Valentine's Day Bracelet would make a very special gift. These are just a few beautiful Valentine's Day gift ideas from the Craftsyble Gift Guide. Fetch it now! Craftsyble is part of Simo Media, a California company dedicated to bringing you the best in the shopping, dessert, and crafting areas. Congratulations! Your bracelets are all so adorable! Wow! I'm really loving that pink one up top! Fabulous! Congrats! I am hoping that you have great sales !